Well the clever minds at Axial Racing had social media in a stir recently with a photo post on Twitter with what appeared to be truck tires and a motorcycle tire along with the SCORE logo in the background. Many RC enthusiasts honed right in on the motorcycle tire and speculated a two wheel offering from the off-road adventure company. 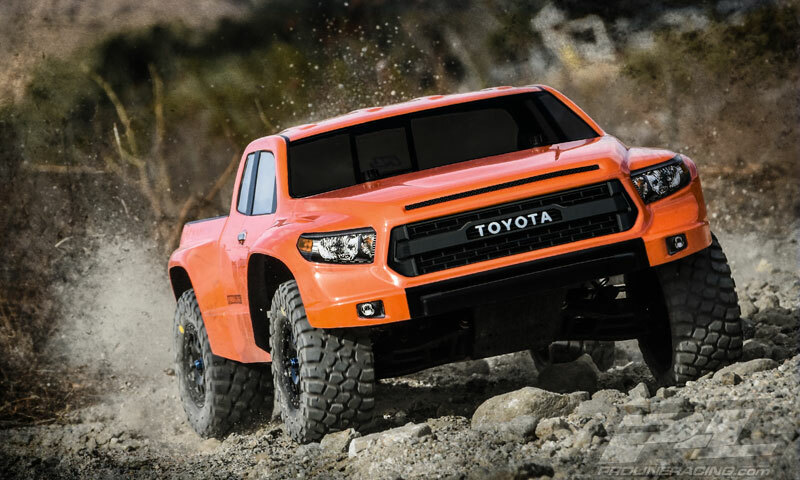 But when the announcement date came upon us what was unveiled was a cool new off-road truck based on the popular 1/10 Yeti chassis. 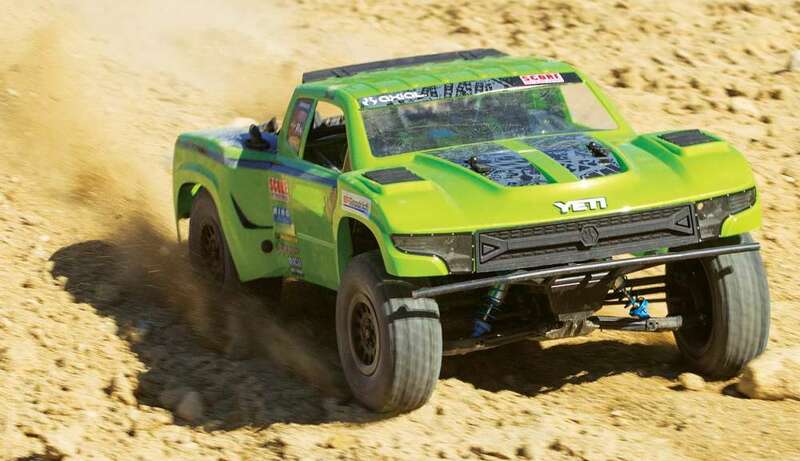 The new Yeti SCORE Trophy Truck Brushless RTR was built to deliver realistic off-road styling and performance for those who follow the popular SCORE off-road series. 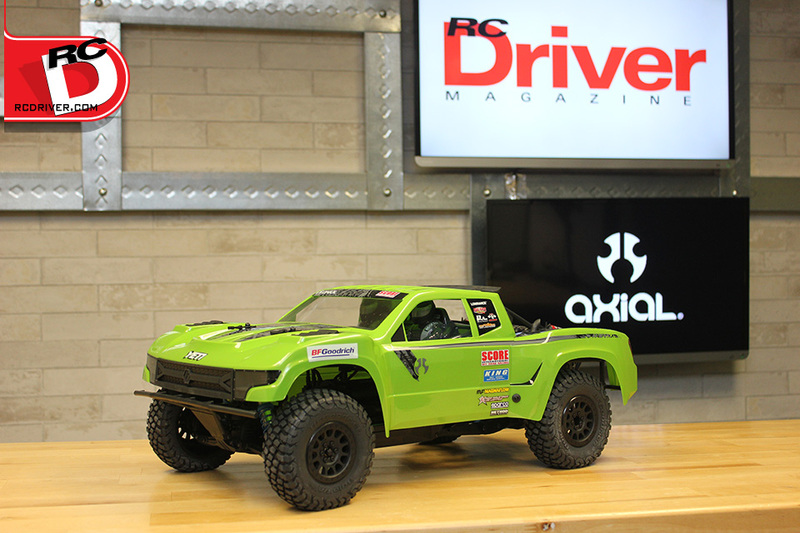 We managed to nab one of the first samples available from Axial and have torn into the box to give you a RC Driver Reveal on this new machine. 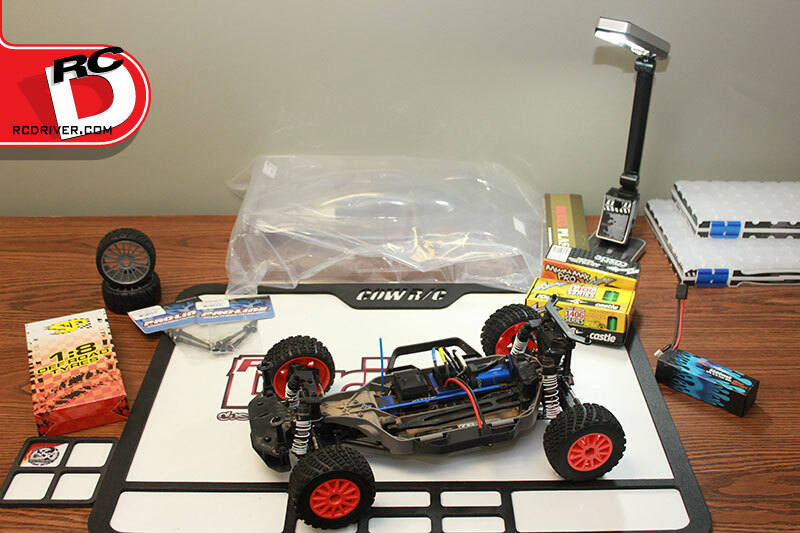 What’s in the box: Assembled vehicle with motor and electronics installed, 2-channel 2.4gHz Tactic radio, misc tools & parts, painted body and manual. We’re going to admit we sat and drooled at the promo video Axial released where they showed the slow motion suspension travel of the Yeti Trophy Truck, it was just way too cool. So when we put the box on our RC Driver Reveal Workbench, it was only a matter of seconds before we tore into box covered in Axial’s typical creative artwork and pulled the truck out and started squishing the suspension ourselves. So the truck is based off the Axial platform, but it isn’t straight up Yeti, there have been some improvements to the machine for better handling and of course to give it the cool Trophy Truck look. Up front you’ll find the rugged independent suspension, but what pops right out are the threaded aluminum shocks with blue caps, perches and springs to give the look of a King Off-Road shock. What also stands out in the nose is the wide front bumper bar with built in skid plate to glide over the bumps and protect the front suspension. Hmm there are holes here for lights too, better order some up now. A tall body mount extends up from behind the front tower to support the body. Then if you move to the back, you’ll see King Off-Road style shocks in the rear and the Axial swaybar kit already linked up to the axle. The swaybar is a must for this machine to help tame the trucks handling with its solid rear axle design. Nestled in the middle of the chassis is Axial’s Vanguard 3S capable ESC and 3150KV motor for crazy power right out of the box and yes it is waterproof too. The controls are now dished out by Tactic gear consisting of the TTX300 3-channel radio, TR325 receiver and Tactic TSX45 metal gear servo. We love the electronics package in this truck, plain and simple. Onto the styling deails, the Trophy Truck body. We’ll admit we were not too jazzed about the overly green body in some of the photos we saw on-line, but once we snagged a look at the color and styling in person, the trucks color instantly grew on us. What’s cooler is the detail sprinkled into the body. Clear headlights cut-outs with substantial plastic light buckets behind them are ready for your LED’s. The tail lights too have LED holders to shine through the red tail-light decals. Plastic vents secure to the front upper fender area of the body and out back, stack exit the body behind the cap. 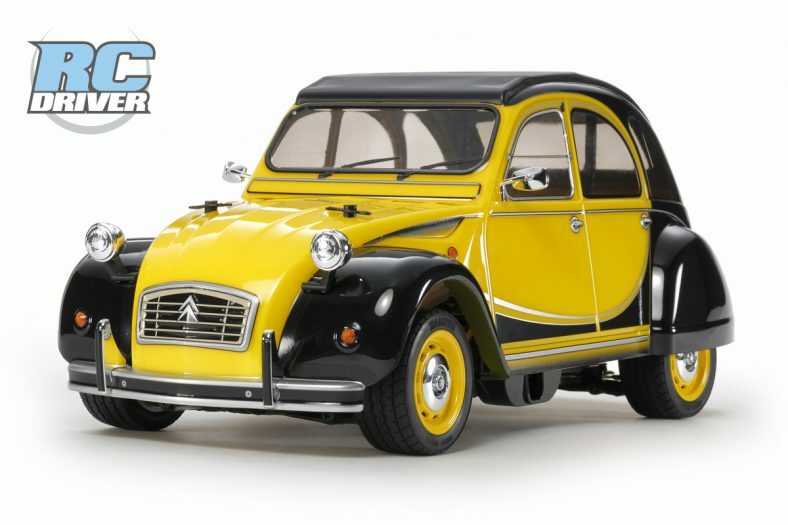 The roof features a flap bolted to the rear and the back of the bed is cut-out for the multi-piece roll cage to poke through complete with full size spare secured in place and faux fire extinguishers on each side. Finally we’ll talk rollers. 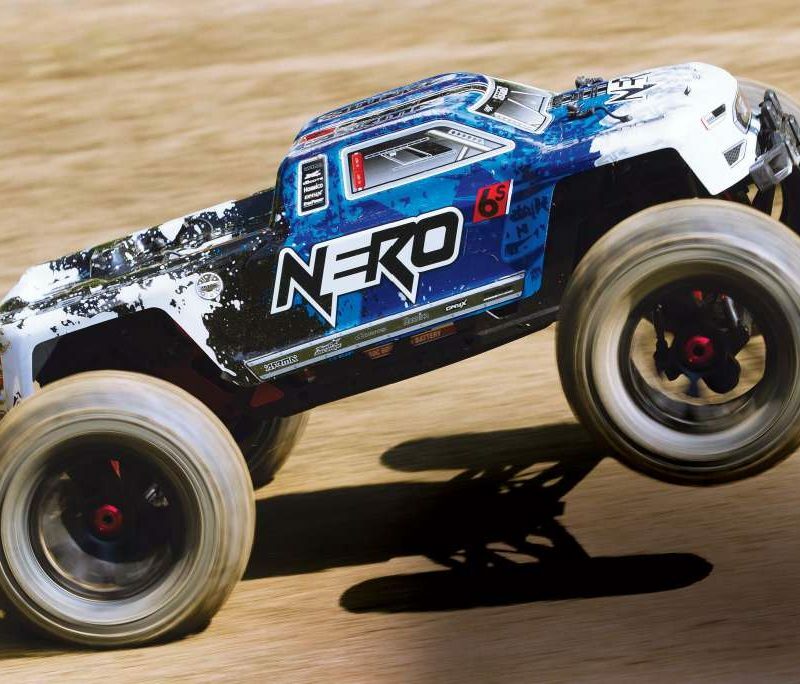 Axial teamed up with BFGoodrich to replicate the Baja T/A KR2 tires in 1/10 in a SB-40 compound. The tires have a chunky aggressive lug pattern and are factory glued to replica 2.2/30 Method 105 wheels and this we say Thank You Axial. We’ve blown so many tires off the bead-lock rims on our Yeti, we’re happy to go back to glue. What is also on the mark is the 12mm hex adapters rather than the cross pin set-up that many Yeti drivers had issue with. 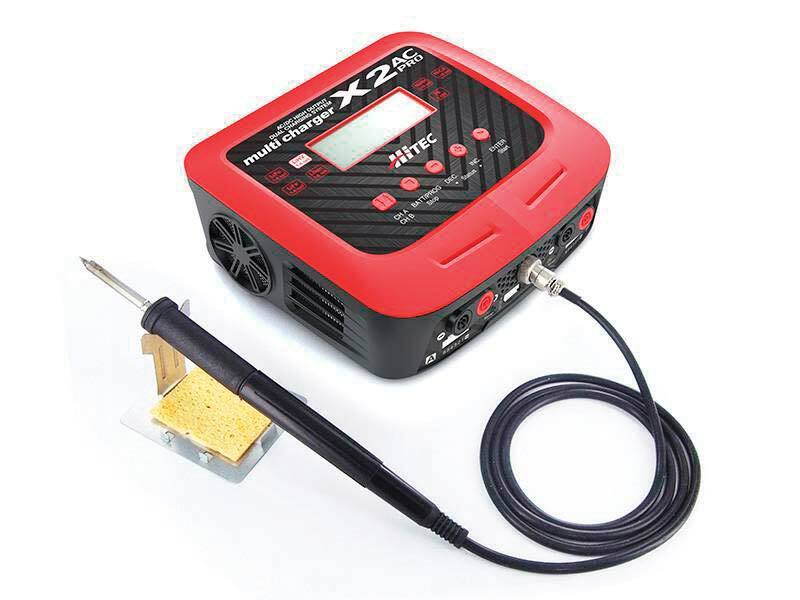 Its probably safe to say may Axial fans have been waiting for a truck like this to be released from Axial and of course it doesn’t appear they held back. There are many other details to go over on the new Yeti Trophy Truck, so you’ll have to check back in for our full review. For now check out our unboxing photos so you can see for yourself all the cool new detail of the Yeti based Trophy Truck.